A place to share my many interests in Architecture, Art, Design, Travel, and Culture. I have to warn everybody, this is a long one. Years ago, before we seriously considered having a child, my husband John read a book: “Living Downstream: An Ecologist’s personal investigation of Cancer and the Environment” by Biologist and Ecologist Sandra Steingraber Ph. D.
John, a NASA engineer, described the book as “beautiful science prose” and proceeded to buy Dr. Steingraber’s second book “Having Faith: An Ecologist’s journey to Motherhood”, in which she describes month by month new discoveries about genetics, the intimate unfolding of embryonic organs, and the architecture of the fetal brain. In the book Dr. Steingraber also recounts her journey through natural labor and birth and her breastfeeding experiences. John read these books privately and didn’t discuss them with me until the day he found a documentary which he thought we should watch together: “The Business of Being Born”. In this documentary I learned about the increasing medicalization of birth, the unnecessary interventions, and the misrepresentation of birth by the media. I saw women birthing their babies with ease, in pain but calm, a far cry from the screaming madness of the movies. When the film ended I was a changed person; while two hours before I had been afraid of pain and of what pregnancy would do to my body, I now wanted to know more, I wanted to explore the possibility of doing what for thousands of years millions of women had done before me. A couple of years later we decided it was time. I took myself out of a doctor’s practice and into a highly rated midwifery program. I trained for pregnancy like it was a marathon, I read Dr. Steingraber’s books, I watched more documentaries, and I looked for other like-minded women and learned of their experiences. I learned Biofeedback. I also sought advice from my OBGYN aunt (who attended my mother during my birth), who told me an “epidural is the first of a cascade of unnecessary interventions that will likely end in cesarean”. My aunt was reluctant to offer pain relief and labor-enhancing drugs to her patients, she believed that all drugs cross the placenta and can be harmful to the baby; instead she liked to let nature run her course, calling on the midwives in her practice for assistance, and intervening only in the case of a true emergency. In June of 2013 I found out I was pregnant. Ever the engineer, John researched statistics and we learned that in an uncomplicated and healthy pregnancy, the outcome of homebirth under the care of a Certified Nurse Midwife is the same as in a hospital. 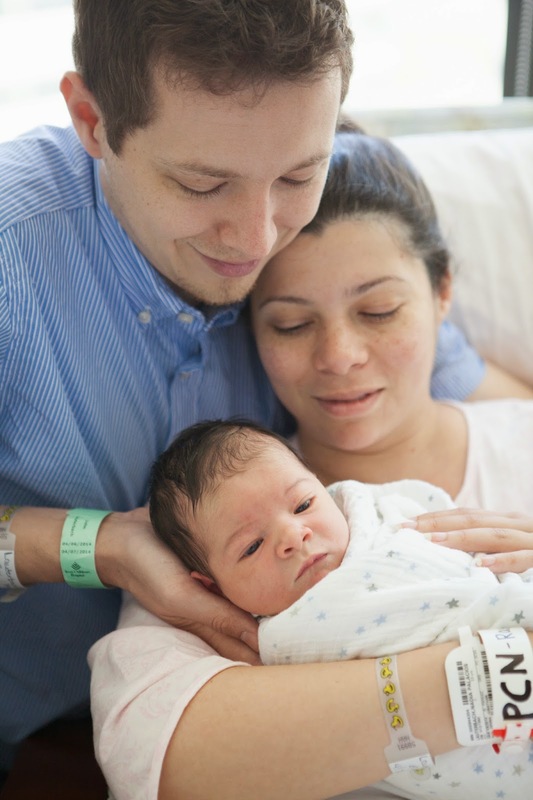 We decided I would birth our baby in the privacy and comfort of our home attended by Kellie Moeller CNM, one of Houston’s most reputable private midwives. Kellie would bring all the necessary equipment to our house and we would have a back-up plan just in case. From Kellie I received the best imaginable care, in our hour long appointments she would perform not only routine checks, but she would also review my food journal, emotional health, and personal preparations for our child’s birth. We took 12 hours of childbirth classes, I read books by Ina May Gaskin and Dr. Bradley, I practiced Pilates, gave up sugar, danced flamenco, walked with our dog Lilly, watched more videos. I became what is known as a “birth junkie”. I had a happy, healthy, and active pregnancy, free of stress and full of love. I surrounded myself with positivity, and while many of friends and well-meaning strangers were eager to share their horror stories, the women in my family filled me with support and shared stories of their own natural childbirths, reassuring me that birth was not a big deal, that my body was made for it, and reminding me that grandma had had 13 children attended at home by her midwife cousin. If they could do it, so could I. My water broke on Thursday, just after midnight and I had my first contraction at 4:00am on Friday. We knew the baby was head down, but occiput posterior (his spine against my spine) and he would have to turn and face me before he could make his exit into the world. I prepared myself mentally for a long labor, as posterior labors tend to be. I called Kellie to inform her of my progress, duration and frequency of contractions and she advised that I conserve my energy, get as much sleep as I could, and call her when I could no longer speak through a contraction. Friday was a beautiful spring day; John presented me with a bouquet of wild flowers from our garden and set up a hammock under our magnolia tree so I could rest there. We spent the day outside, John and my mother reading in chairs next to me and our dog Lilly playing at my feet. The contractions came like waves, 15 minutes apart, and I would close my eyes, relax my body and breathe deeply through them. I had learned in biofeedback that pain is intensified by our flight or fight instinct, in which we tense our body for self-defense; deep relaxation on the other hand, would lessen pain. Though labor had started early in the morning, my contractions had remained steady in duration and intensity throughout the day. John and my mother were confident in my “athletic’ ability and kept reassuring me that labor would pick up soon and it would move faster, but I knew better and instead of despairing at my slow progress I reminded myself that posterior labors are lengthy and what was happening to me was normal. In the late afternoon we decided to take Lilly out on a walk in the hopes that it would help speed things along. John and I walked slowly stopping every now and then so I could breathe through the surges. My mom made dinner and we went to bed. The contractions slowly intensified as the evening progressed and soon I felt that I could no longer stay in bed and I remembered from my classes that a supine position intensified pain. I paced around the house in the middle of the night, one contraction at a time, and when exhaustion took over I napped on the rocking chair of our expectant nursery while John slept next to me on the sheepskin rug. At 5:00am on Saturday I decided I’d had enough pretending to sleep and I roused the house asking for a hearty breakfast. I got in the shower and let the hot water wash over my aching lower back; the feel of the water was such amazing relief and I looked forward to the moment when I could immerse myself in the birth pool. At the same time, my contractions picked up in speed and intensity, 2 minutes apart! I could no longer speak through them and I required all of my concentration to relax the pain away. John called Kellie and informed her of my progress and she asked to listen to me during a contraction. In natural childbirth women are encouraged to vocalize in low pitches through contractions, the belief is that a high pitched cry will tense one’s body and intensify pain, while a low, guttural moan will relax the muscles and decrease pain; the sounds a woman makes during labor can be very telling of her progress, Kellie must have heard something special in my sounds because she said “I’m on my way”. My mom made pancakes and excitedly we waited for the midwife. Kellie arrived with all her equipment and immediately set out to check on me and listen to the baby; he was doing great, she said, tolerating contractions well. Soon after her arrival my contractions slowed down to 6 minutes and 7 minutes apart, and Kellie reassured me this was normal with posterior labor and encouraged all of us to rest some more until the pace picked up again. The morning wore on in the same pattern and around lunch my friend Jamie, who I had asked to be my doula (labor support), came armed with supplies and a plan to turn the baby around. Jamie, who was 9 months pregnant herself, taught John how to use the “rebozo” technique, an ancient practice used by Mayan midwives to support the belly and help the baby into a better position. The baby was doing great and Kellie informed us that she needed to go back to her office and that I should keep doing inversions and working with the rebozo until she came back later in the afternoon. They worked as a team, John, my mom, and Jamie, taking turns to support me through the contractions, providing counter-pressure to my lower back and hips, and working with the rebozo. Kellie returned to the house late afternoon to find that the baby’s position had changed and he had rotated to face me! My mom jokingly declared that Jamie was a witch and that she had helped the baby get into alignment with her ancient wisdom. The contractions were stronger now, but still 6 to 7 minutes apart, not exactly the frequency required for active labor; Kellie said that I had two options: keep moving to encourage progress or take some medicine to slow down labor so I could get some rest. I wanted to keep moving but Kellie thought that rest was a better option because I would need all my strength in a few hours, so rest it was. I went to bed and soon realized that laying down was unbearable, and I thought “this is exactly why people ask for anesthesia”. Lying in bed was not an option so John set up a yoga ball in our bedroom next to the bed and propped me up with pillows so that I could sleep. I spent the night alternating between the rocking chair in the nursery and the yoga ball in the bedroom, sleeping 15 minutes at a time. As the night wore on I found myself headed for the bathroom frequently, not exactly out of need, but because that position made me more comfortable and I took that as a sign of real progress. By 5:00am on Sunday I had come to the conclusion that sleep was impossible. I went to the living room where my mom and Kellie were sleeping on couches, told them I was ready to start the day. Kellie checked on us, the baby was still doing great and I was inexplicably full of energy. By 6:00am Kellie stated that I had entered active labor and declared “today is the day”, we were going to make things happen. The contractions were definitely closer together and more intense, but I kept breathing, and moving, and relaxing through them, mentally repeating my affirmations of “I can do this”, “mind over matter”, “relaxed and calm”, and “no pasa nada”. By lunch time I was tired and Kellie suggested that I try lying on my side to sleep for a bit. John took me to bed and massaged my back while labor slowed once again to 20 minutes apart and I fell deeply asleep between contractions. A few hours later Kellie got quiet and said we needed to exercise caution: the baby’s heart rate was accelerating and she feared this could be caused by infection or dehydration. She also feared I was too exhausted and, at only 4cm dilated, I may not last another day without some medical help. Kellie suggested we transfer to the Pavilion for Women at Texas Children’s Hospital, where she hoped they would be more accommodating of my natural birth plan. Best case scenario the baby was fine and Kellie would request a Pitocin drip to bring back my stalled labor. Worst case…we discussed the possibility of a C-Section and I cried as I saw my months of preparation potentially going down the drain. As we drove to the hospital my body shut down and I experienced only one contraction in the car. I thought of Ina May Gaskin describing how animals in the wild will stop their labor to flee if they feel threatened, so too women bodies if their process is interrupted. We arrived at the Pavilion and were greeted by friendly staff familiar to Kellie. They admitted me and checked on the baby, he was doing great, no need to panic! Kellie talked to the OB on call and she started me on IV fluids and a very small dose of Pitocin. Soon after the staff shift changed, and the friendly OB was replaced by an extremely annoyed and condescending woman, who accused me on not having received any pre-natal care, despite holding my huge folder of records in her hand and the presence of my most capable midwife. She read my birth plan, and without touching me or even approaching me she declared that my baby had “macrosomia”, (which is just a fancy way of saying that I was carrying a big baby), that he would weigh 10 pounds (the most recent ultrasound estimation, with a 15% margin of error, had calculated that our baby would weigh 9.6lbs), that he was huge and would get stuck, and that I wasn’t able to birth him normally. A C-section was in order and she wanted me to comply immediately. The doctor checked me and declared me to be 4cm dilated, 90% effaced, and baby at station 1. She walked out of the room to let me ponder her pronouncements and succeeded in terrifying my mother, who up until now had been my rock. My mother was pleading with me to accept the cesarean so as to not “endanger the baby” when the other attending OB asked to check me and said there was no way my baby would weigh 10lbs; Kellie then whispered in my ear reminding me what I had learned in my classes: once a baby is past station 0 he has made it through the narrowest part of the pelvis and if he can make it through that, he can make it out. I relayed this information to my mom and reminded her of the benefits of a vaginal delivery: The baby’s lungs would be squeezed off their fluids as he made it through the birth canal; a cesarean baby on the other hand would run the risk of respiratory problems and future asthma. My baby would be colonized with good bacteria present in the birth canal, boosting his future immune system. My baby would be born alert and ready to breastfeed, a cesarean baby would be born drowsy from medications, may need resuscitation, and breastfeeding may be jeopardized. The OB also informed that if I “fell off the labor curve”, the time and pattern she was willing to give me, she would do a C-Section on me. I once again declined the procedure, thanked the anesthesiologist for his consult and told him that I would not need his service. The knowledge that my baby was not in danger gave me renewed strength to keep laboring and the threats from the OB had awakened my competitive nature. The nasty OB returned to check me again (4.5 cm) and said my water was still half full (Kellie had me drink water “until it was pouring out of my eyes” to prevent loss of amniotic fluid) and that she needed to rupture it. In between contractions I analyzed the risk of artificially rupturing my membranes (AROM): infection, stronger contractions (a desirable one), but most importantly cord prolapse. Knowing that the baby had already descended into the birth canal reassured me that the later was no longer applicable and I accepted the procedure. The Pitocin drip was working and the contractions now came at a regular pace. Pitocin is the synthetic version of Oxytocin (the “love” hormone) and it can bring on or strengthen contractions during childbirth, Pitocin carries a risk of fetal distress and cesarean, as the contractions can become too strong for the baby to bear, particularly if the mother is under epidural anesthesia. It was soon determined that Pitocin was too strong for the baby, so the drip was removed and I continued to labor drug-free once more. In our childbirth classes we had learned that a woman in active labor enters a state of altered consciousness, dominated by primal instincts, and it is detrimental to the process to make her engage her rational mind. Now that all arguing with the doctor was over I could resume my work without interruptions. At that moment I remembered my cousin Ximena telling me that she became an “animal” during the birth of her daughter, losing all notions of time, place, and self. Jamie now encouraged me to enter what she called “laborland”, allowing my endorphins to take over. Courtney, the wonderful nurse, had set me up on a portable monitor so I could move around. I paced back and forth from the bathroom to the bed, swaying, rocking, and dancing my baby down. In the bathroom my mom whispered that I should push when I felt the urge and I chuckled and said that one doesn’t push until 10cm dilated! But I asked Kellie her opinion, and Kellie said that my mother was wise and I should do as she said. Soon after I felt an overwhelming need to push, and even though I was about 6cm, I pushed. The relief! Pushing took away the pain, pushing felt incredibly good! The contractions, which until now had had an upward feeling, opening my body for my baby, were now pulling me in a downward pressure. I pushed and the pain disappeared, the clock of the “labor curve” was ticking but I was in good spirits, I could do this! Kellie told Jamie to look at my face, I was smiling during contractions. Once again they all worked as a team: John, my mom, Kellie, and Jamie. They supported my body, applied counter-pressure, and massaged my back. While at home I had been able to eat and drink at will, I was now allowed only ice chips to keep my stomach free of contents in the event of an emergency surgery. My mouth was on fire from thirst and the ice was not enough, so John secured contraband water which he fed me discreetly with a straw. I grew tired and my resolve started to falter. I told Kellie that I was very tired, and she said “you’re nearly there, you can do it”. At that moment I realized that I was in “transition”, the last part of active labor when a woman body opens the last few centimeters in preparation for birth. Transition is the most intense stage of labor, but also the shortest, and in an un-medicated mother it is characterized by a falter in resolve, usually externalized by saying “I can’t do this anymore”. This is the moment when one might be tempted by an epidural…but I was still pushing and pushing took away the pain! So instead, I asked Kellie: “is this transition?” she smiled and said “yes, Nadia, this is transition”. Courtney, the nurse, checked me and said I was 9.5cm, a few more contractions and I would be ready to birth my baby. We had learned with Kellie that after transition your body gives you a break (1 minute, 5 minutes, everybody is different), and this was true for me. The contractions stopped and we discussed my birthing position. The OB wanted me supine – convenient for the doctor, but for the laboring woman it is the most inefficient posture in which to bring forth a baby - and she wouldn’t have it any other way. Kellie made me visualize myself in a squatting position, she made me think of the muscles I would engage in that situation and I recruited all my Pilates training and mentally thanked Kat Bigbee for keeping me in shape. The contractions started again, building up in three or four part peaks. “Deep breath in and blow it away” the first peak. “Deep breath in and push”, the second, third, and fourth peak. Kellie had my right leg and Courtney my left, together they encouraged me along while John whispered in my ear and caressed my face. My mom had positioned herself in front of me and was keeping a visual commentary of my progress. It hadn’t been very long when I started to feel a burning sensation and I said out loud “it burns!”, Kellie said “it will burn more”, but I wasn’t complaining, I was having an epiphany. I now asked “Kellie, is this the Ring of Fire?” and Kellie said “yes, Nadia, this is the Ring of Fire”. My baby was crowning, I was almost finished! Courtney then said “Nadia, I know your instinct is to push but we need to wait for the doctor”. Not pushing was horrible; it was extremely difficult to ignore the urge! Kellie suggested I blow my breath, like for a candle. I could see the staff getting ready and I could swear that they were taking their time putting on their gowns. I was mad because I knew that I didn’t need the doctor to “catch” the baby, if my legs hadn’t been put in stirrups right before I could’ve done it myself. Kellie was now at the head of the bed so she couldn’t do it either. Finally they were finished counting instruments and putting on their gowns and I was told to give it my all. I heard my mom cry “ahí está!” (there he is! ), and they placed my baby on my chest. John Alexander was born at 4:02am on Monday morning, a whole 3 days after my first contraction. He was crying lustfully and received an apgar score of 9. I was crying too and John was crying. Jamie was taking pictures and I could hear crying too. My mom came around to the head of the bed to look at Alexander and said “this is your son! He is your son!”. John cut Alexander’s cord. Alexander started smacking his lips and we recognized that as his rooting instinct, his search for the breast. I let him follow his instinct to do a “breast crawl” and find my breast by himself and once he did, he nursed eagerly! Meanwhile the resident doctor was attending to me in typical hospital protocol, painfully tugging and pulling at the cord to remove Alex’s placenta from my body, instead of allowing the uterine contractions that nursing Alex were creating to gently release the placenta. The doctor told me I had a small laceration inside and she would take care of it. Kellie said the laceration was inconsequential and I shouldn’t worry. I had given birth without the need of an episiotomy or any trauma to my perineum! Alex’s continued to nurse for a good while and then it was time to check him and weigh him. 8lbs 13oz, 21.5 in. A far cry from the “huge” 10lbs baby I couldn’t possibly deliver. I couldn’t help but point that out to the nasty doctor. We refused shots and ointment at that moment, we wanted to bond with Alex uninterrupted and minimize more shock for his little body. At home he would’ve opened his eyes in gentle candlelight, at the hospital he was put under bright lights, an offensive contrast to the cozy darkness of my womb. 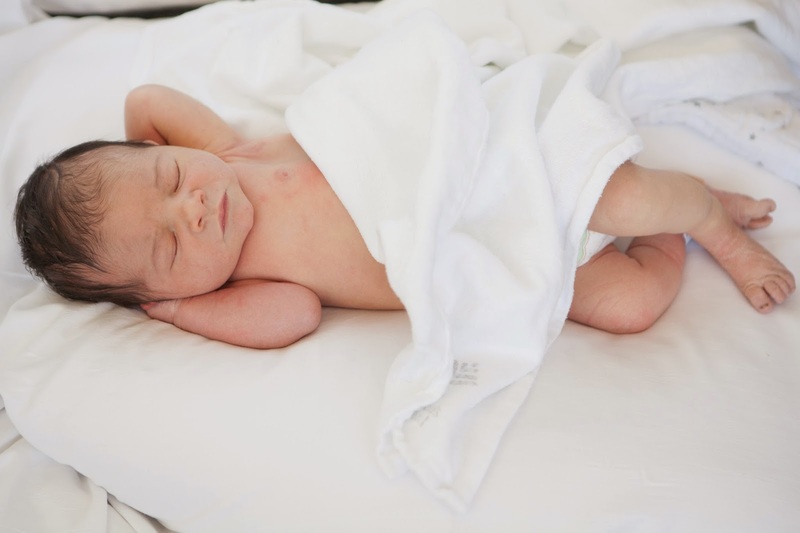 We took Alex to our recovery room where he turned out to be an eager nursling and a happy baby. Alex was perfect, no infection, no dehydration. I was in good health too and we were released a day later. Kellie continued to care for Alex and me at home in the days and weeks following his birth. We fell in love with our son; he was everything we hoped and more and we were on such a natural high after his birth! The realization of the power of my body, the immense pride that John expressed in me, and the love this new little person demonstrated made every hour and every contraction worth it, a thousand times over. Alexander is our joy, we are forever blessed by his arrival. 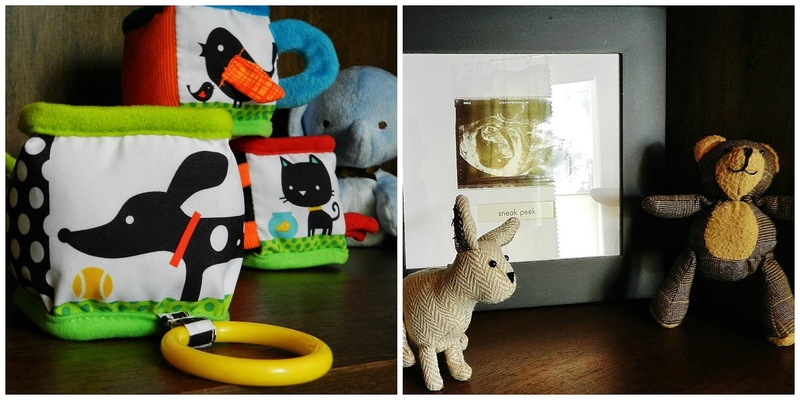 When I found out I was pregnant with a boy I immediately started thinking of his nursery. Though at first I wasn't sure which design direction to take, I was certain of what I didn't want: primary colors, plaid, sports, or the dark and serious themes I like to call "Baby CEO". I wanted Alexander to have a bright and happy room in which he could transition from infant to toddler. Being a design professional I have access to a myriad of cool products, and my inspiration for Alexander's nursery palette and theme came from a wallpaper runner by UK based Harlequin; once I had secured the wallpaper everything fell into place. I framed the wallpaper as art, used it to recover a lamp shade and made it into memento boxes. My style is traditional with a fresh twist. I like rooms to have a collected look as if they have evolved over time. I love to combine different pieces, styles, and textures. I selected the nursery furnishings from a variety of vendors, many of which don't trade in baby products. Wallpaper (framed as art): Jungle Jamboree by Harlequin. Paint colors: Sherwin Williams Extra White and Sherwin Williams light French Gray. Crib, Dresser, and Bookshelf: Restoration Hardware Baby. Rocking Chair: Oak, custom designed and made in Nicaragua. Floor Lamp: Restoration Hardware Baby. 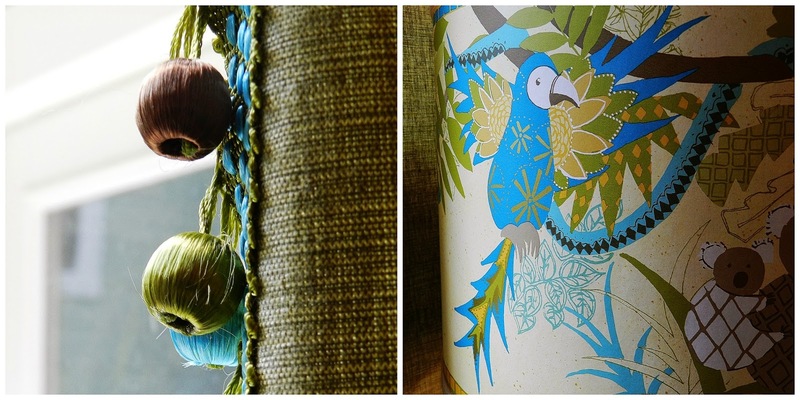 The barrel burlap shade is covered in Harlequin wallpaper. Lambskin Rug: Crate and Barrel. Art: Framed Harlequin wallpaper, vintage Italian prints, painting by Houston artist Anita Nelson. 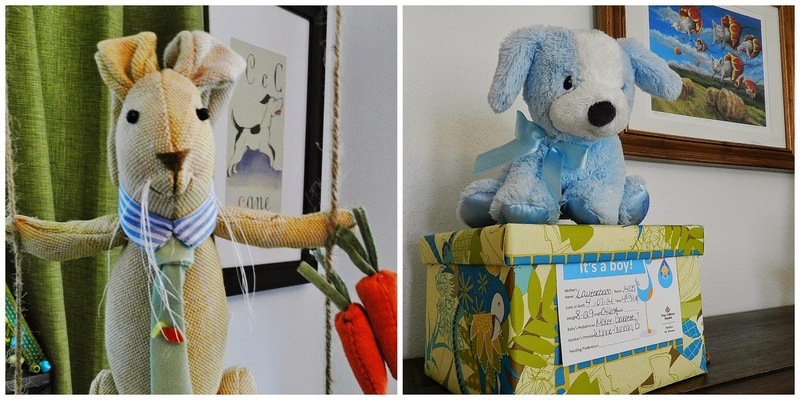 Hanging Rabbits: Pottery Barn Kids. 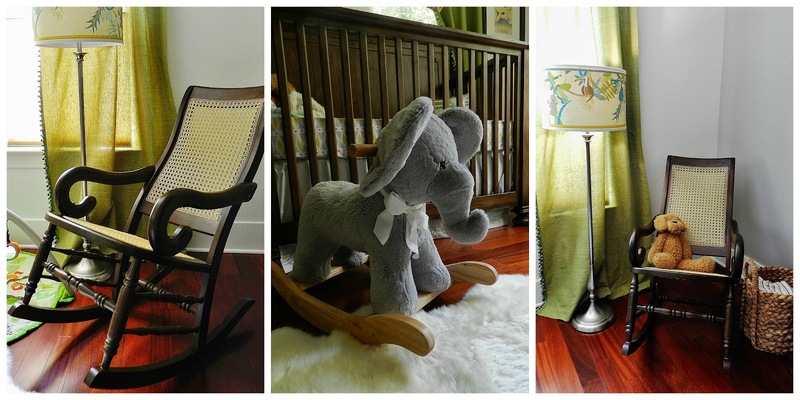 Rocking Elephant: Pottery Barn Kids. Lulu the Lamb by Baby Style: Right Start. 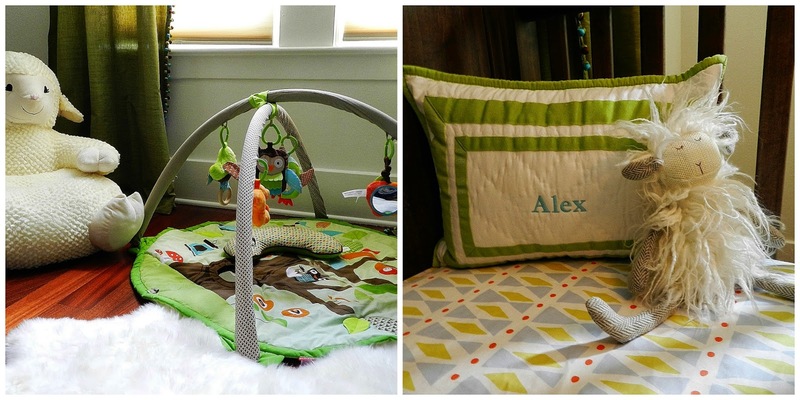 Monogrammed pillow: Pottery Barn Kids. Stuffed animals and toys: Restoration Hardware Baby and Right Start. Treetop baby gym by Skip Hop: Right Start. This week's cute house is a sensitively renovated and expanded bungalow. All photographs, drawings, and text presented on this site are the intellectual property of Nadia Palacios Lauterbach, unless otherwise noted, and may not be used without permission from the author. Copyright Nadia Palacios Lauterbach 2016. Powered by Blogger.